Here is some pics. I am busy fabricating a new plenum, and I will take pics as I go along. Here is with the single row injectors. The stuff between the IMG tags MUST end in either .jpg or .gif. The blue car is it's original colour. I first removed the booster to make space for the plenum but as you can think the brakes pedal was very stiff. I played around with different master cylinders till I found one that gave me the correct pedal feel. It has decent brakes but I need an upgrade it tends to fade after 3 or 4 fast laps. My budget is very tight and I do everything myself so I will look around till I find something suitable. For those EDIS aficionados, here's the distributor block-off method using block freeze plugs. yo. There is some interesting misconceptions about using the distributor area as a breather port, this in my opinion is a very bad idea. It will not work as expected at all. You'd be better off just drilling and tapping the valve cover (it is thick enough after all) if you require extra breather. what about someone who ISNT using megasquirt, is there factory Bosch sensors we can use. Not sure about your question, but I figured I'd better clear something up here. You can use megasquirt with any type of sensor that is resistor based for temperatures, however using the gm sensors is -easy- and cheap, which is why most people do it. If you know the temperature vs resistance curve of your sensor, you can simply program it into the megasquirt. It will not work as expected at all. Can you elaborate? Not sure I understand why...if you have negative pressure it should vent from there as well as anywhere else, would it not? Sure, there is a 6mm(approximately, haven't measured it) drain hole at the bottom of the distributor housing that drains the oil that fills the distributor housing for lubrication purposes, this is the only hole that would allow the crankcase to 'breath'. During operation of the engine, it is filled with oil that is flowing from the rear bearing, it can't really 'breath' it would be not effective at all as a breather. It would have to be enlarged quite a bit before it would be effective. 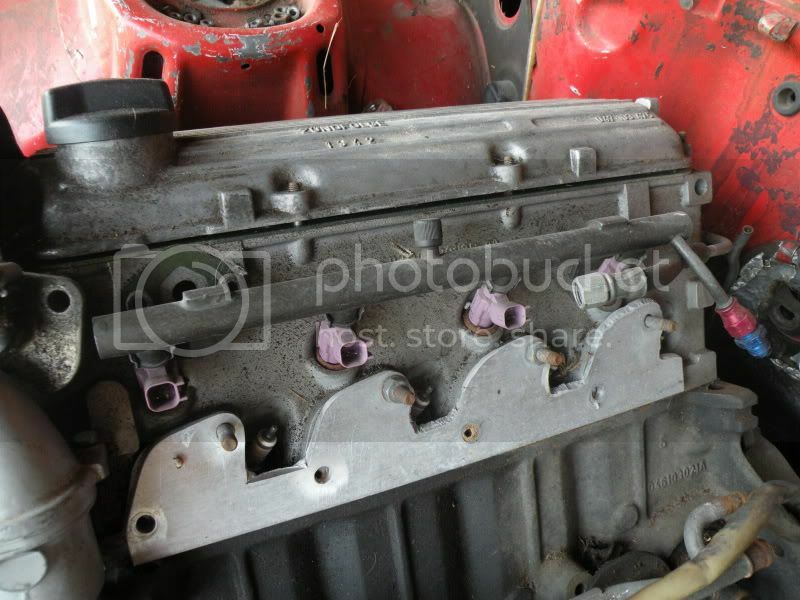 If insufficient breathing is an actual issue on your motor(pressurized crankcase), what will probably end up happening is the oil from that cavity will end up being pushed back up the breather you've created and spilling out someplace. Rather than a slightly pressurized oil gallery being created back there which is what happens normally. Ahhh...makes sense. One of the GTRs had a breather fitting attached to the side of the oil filler boss. I have a spare one of these, minus the cool fittings. 60 bucks delivered.